A: Standard check-in time is 1pm but we will work with you whenever we can if an earlier check-in is required. Please be aware though in peak times, it is often impossible to facilitate a check-in before 1pm! Q: Are you walking distance to places to eat and see? A: Yes! 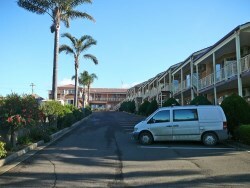 We are ideally located in the centre of Eden, directly opposite the Eden Fishermans Club www.edenfishermansclub.com.au and a short stroll to either Snug Cove Wharf or any number of dining establishments. The museum is just up the street and the beach is a leaisurely stroll away! Q: Do you have onsite parking? A: Yes, there is ample onsite parking available. Our guests on motorbikes are invited to use our indoor garage. A: Yes, all rooms at Twofold Bay Motor Inn are non-smoking. A: No. Twofold Bay Motor Inn offers breakfast to guests who would like to order. Being directly across the road from the Eden Fishermans Club and less than 20mtrs from numerous other dining offerings, you are well catered for! A: Yes, we provide wifi for all guests at NO charge. A: Yes, we have an indoor pool that is available for use other than in winter. The pool is heated and indoor. A: We are in the best location in Eden less than a minutes walk to all shops. A: Cancellations must be made at least 48 hours prior to check in date and time. Cancellations received less than 48 hours, the full amount for the first cancelled night will be charged.